As global organizations see the impact of influencer marketing initiatives across the customer journey, the pressure is on to develop sophisticated, measurable programs capable of supporting enterprise-wide strategies. The challenge these organizations face is to develop a scalable influencer marketing practice that instills alignment with corporate strategy, business units or brands and regional needs, while ensuring all stakeholders have the data, structure and reporting framework needed to evaluate success and iterate. The opportunity for influencer relations to impact audience engagement spans the entire customer journey. As such, influence requires collaboration from all corners of an organization and necessitates a group of champions to earn executive attention beyond any one function. In our research report, Influence 2.0, based on input from over 100 global brands, half of those surveyed state that four or more departments engage with influencers now. And, more than two-thirds (80%) say that three or more departments work with influencers today. Given the cross-functional requirements of a successful influencer program, the work to scale an influencer marketing program within a global organization demands a focus on standardization, systematization and coordination. While each organization’s implementation is unique, among the most advanced organizations, patterns are emerging. Most notably, the creation of a centralized hub for influencer strategy. An Influencer Marketing Center of Excellence is an organizational framework for scaling enterprise influencer marketing whereby a core team of communications and marketing professionals support enterprise-wide business objectives with a unified strategy, methodology, measurement framework, and tool set. The Center for Excellence harmonizes influencer practices and enables the rest of the organization to work effectively, respectively and measurably with influencers of all types. A Center of Excellence will typically be responsible for the following core responsibilities. Unified Strategy: Establish best practices for the organization, including standardized KPIs, setting rules of engagement for influencer outreach and developing an organization’s Influencer Strategy Playbook. Relationship Building: Liaise with business units and regional groups to identify influencer relationship needs based on business goals and provide a cohesive brand experience for influencers outside of events and other shorter-term engagements. In The Rise of Influencer Marketing in Technology Organizations, Amanda Duncan, Customer Lifestyle Influencer Relations at Microsoft emphasizes the importance of investing time in building relationships. Activities with influencers between campaigns and events are arguably just as important for relationships as those larger participation efforts. It's a time to really focus attention on the content your influencers are creating and adapt your approach to working with them as opportunities arise. Technology & Reporting: Manage technology to optimize processes, stimulate collaboration across geographies and departments, allocate resources, measure results and, provide data-driven insights to teams to maximize their impact. Training & Workshops: Provide training to internal stakeholders on influencer relations, outreach strategies and the tools sets. Influencer Match-Making: Develop executive and subject matter expert (SME) influencer outreach programs to build strong relationships with influencers. Provide coaching, facilitate in-person meetings and identify opportunities for engagement. Leverage technology to provide crucial data about influencers’ audience size, demographics, behaviors and engagement levels, as well as, insights into which channels, brands and topics are most aligned to a specific influencer. Manage an enterprise-wide influencer database where essential information on each influencer can be stored including outreach, content and engagement tracking, as well as, task management and relationship history. Ensure a unified experience for influencers with the organization and brand. Product launches, events and campaigns all come and go, while relationships are built over time. For example, Intel created an Influencer Management Review Committee, spearheaded by the CMO, to ensure business partners established appropriate plans for engaging with influencers. A key element including ensuring a relationship owner was assigned to each influencer, responsible for maintaining that relationship even after a campaign was completed. Provide a framework for consistent and readily-available measurement across influencer programs and campaigns. This includes regular production of benchmark Share of Influence reports and building up strong historical data sets related to influencer activities that enable the development of attribution models. Read more on best practices for influencer marketing measurement. Work closely with legal teams to ensure compliance with regulatory requirements, including disclosure, and monitor influencer engagements for contractual requirements where applicable. Beyond legal requirements, compliance extends to establishing and maintaining brand guidelines for influencer programs, including influencer vetting, content, compensation and engagements across the organization. 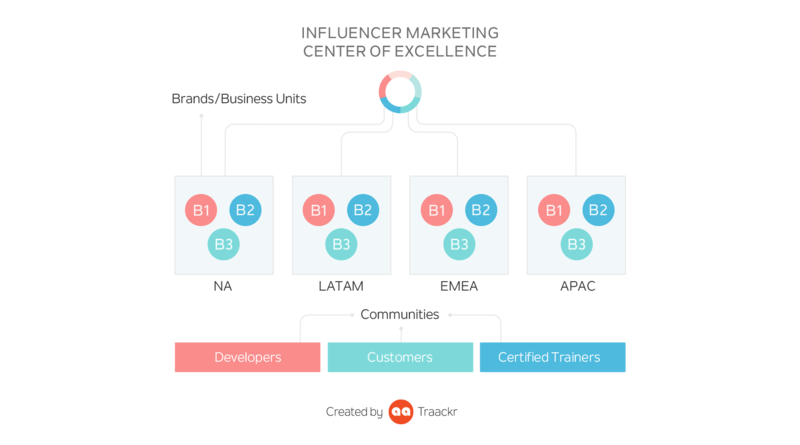 The Influencer Marketing Center for Excellence provides a framework for optimization of resources, coordination of efforts and mitigation of risks associated with scaling global influencer strategies. Ultimately, these centers will support their organization's transformation and empower all stakeholders to connect with their audiences in meaningful ways at scale. Learn more about how Traackr supports global influencer marketing with an end-to-end influencer relationship management solution.